As the old saying goes, what’s sauce for the goose is sauce for the gander.? 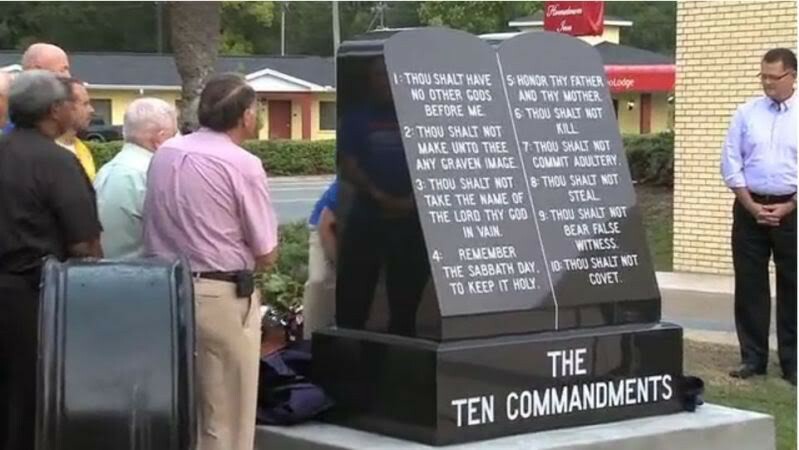 And now people entering the Bradford County Courthouse in Starke, FL will be able to have a gander at both a monument featuring the Ten Commandments and another one which will feature quotes celebrating secularism as well.? And why not? Having lost the battle to have the original monument to the Ten Commandments removed, the national organization, American Atheists, has decided that it will simply erect an additional monument – one which celebrates its animating ideology.? The decision to build a monument to secularism signals that they now are willing to compete in a “game” which they previously argued should not be played at all. Some will argue that this is a hypocritical move on the part of an organization which for years has argued that public grounds should be as neutral as possible.?? Some will make that argument, but they would be wrong.? Instead, the decision to build the new monument represents a new and more mature approach to how we use public space. Rather than spend more effort on seeing how empty we can make the American public square, we need to see how expansive and inclusive it can become.? No, this is not an argument for an “anything goes” approach, but it is an invitation to change the initial response, especially from atheists, secularists, and more rigid legal liberals, to the issue of what symbols and celebrations can find a legitimate spot in American public life. Rather than beginning with the premise that less is more, and that our collective freedom is best protected when more of who any of us is, is left at home and in private, we can shift to a “more is more” response, and cultivate a culture in which all of our freedoms are best protected when we can celebrate who we are as openly as possible.? To be clear, this attitude will frustrate many cultural conservatives when it is applied to a whole range of social and sexual issues, but that is for another time. In the meantime, the existence of these two monuments should not been seen as in competition with each other, even though some, including many of those who supported erecting them, undoubtedly see it that way.? The presence of these two monuments, side by side, should be seen instead as complementing each other. This is a moment that some will frame as “either/or”, when in fact, it is really about “both/and”.? Each monument celebrates a piece of what has made, and continues to make America great.? Each honors ideas without which we would be the poorer, and leaders whose leadership has enriched this nation.? While either monument alone could be construed as problematic, taken together, they are a gift to the people of Bradford County, and actually, to the rest of us as well.